Driving a truck off-road is the second most fun thing you'll ever do. After riding a motorcycle off-road, of course. Here's how you can start doing it, even if you don't currently drive the world's most capable vehicle. 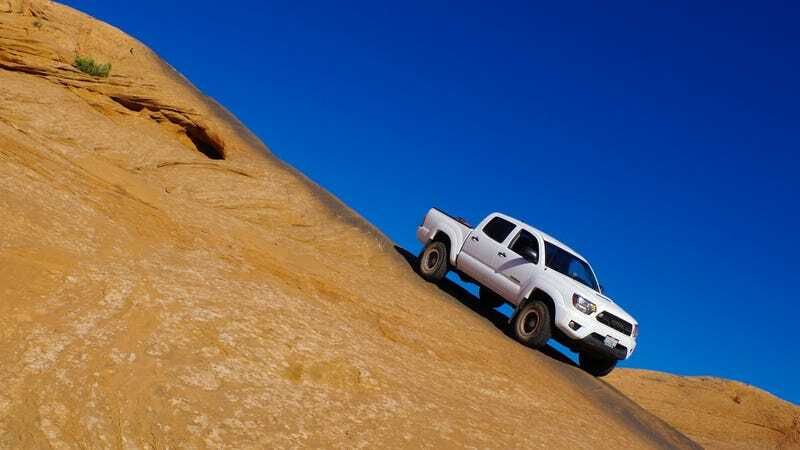 What Do You Want To Know About The Toyota Tacoma TRD Pro? Vehicle Requirements: It really depends on the type of terrain you're planning to tackle. In general, you'll be surprised at how capable even relatively humble machinery can be, if you know how to use it properly. As with all things, skill and knowledge are your most effective pieces of equipment. Your average two-wheel drive passenger car should be capable of tackling a simple dirt road or crossing some sand to get you out onto the beach, even with an open differential, Front-Wheel Drive, poor ground clearance and economy road tires. You just need to go slow, chose a line through and around obstacles and concentrate on maintaining momentum uphill or through soft surfaces. Decreasing tire pressures (you can go as low as 12 or 15psi on stock equipment) will help with traction on loose, slippery or "deep" stuff like sand or mud. Just don't go too far and don't head out by yourself. A high ground-clearance, All-Wheel Drive vehicle such as a Subaru Outback will make it down pretty much any fire road, no matter how poorly maintained it may be. That means this is all anyone really needs to go camping or access remote areas. A fire road isn't technically "off-roading" as these are still officially considered roads, albeit rough dirt ones. That also means this type of driving is what you'll most often encounter on public lands. But, to tackle a 4x4 trail, off-road park or to just really get off a road, you'll need a real Four-Wheel Drive vehicle equipped with a low-range gears, a real transfer case, large tires, steep angles and highly articulated suspension. Locking differentials are becoming rare on stock vehicles, but will further boost your off-road capability. On-Board Equipment And How To Use It: Your AWD or 4x4 vehicle may have some of the following equipment; the more it has, the more capable it's going to be. Let's go through all the various buttons, switches, knobs and levers you may have and talk about how to use them. Transfer Case: This used to be a manual "stick" similar to a gearshift, but has over the years more commonly become a button, switch or dial. You'll see options for "Two High," "Four High," and "Four Low," or similar verbiage. 2WD is going to be your go-to mode anytime you're on pavement and your vehicle can actually get a long, long ways off-road while staying in that mode. Keeping it there will give you the best fuel economy and the safest on-road handling. Switch to 4WD if things get slippery or if you need to climb a moderate incline where the front wheels may help transfer some power to the ground. Use 4 Lo when you need the engine to have more leverage over the wheels by using very, very low gearing. Typically, you're going to want to use that for steep descents; the very low gearing will control the speed of the vehicle without diving its suspension or overheating the brakes. But, 4 Lo can also help you creep over tall, steep obstacles or up steep rock faces. It's a good idea to be in 4 Lo anytime you're around anything steep, just to retain maximum control over your vehicle. If you're a real man, and drive a manual transmission-equipped truck, switching into Lo will enable you to walk the vehicle over low-speed obstacles using only the torque provided by the engine idling. This allows you to stay off and thus preserve the life of the clutch. Traction And Stability Control: These are on-road safety aids that will just get in the way the second the going gets dirty. Traction control kills power if your driven wheels being to spin up while on the gas; as such, it's safety benefit is fairly minimal. Stability control works through the ABS system, applying individual brakes on all four corners to keep the car from spinning or sliding. That's a more substantial system and often one that takes more than a simple button push to defeat. Pull out your owner's manual and familiarize yourself with the function of these systems; sometimes, just switching to 4WD will turn off TC, but often you'll need to push and hold a specific button while patting your head and rubbing your belly simultaneously to defeat stability control. Every manufacturer has its own, obtuse name and acronym for these systems; but they're all just traction control and stability control in the end. Off-road, wheel spin is your friend. Locking Differentials: Engaging these "locks" both wheels on an axle together, making them spin at equal speeds. This can be dangerous on the road, where the outside wheel needs to spin faster than the inside one to complete a corner, but can be a massive traction aid off-road. Typically, you're only going to want to lock your diffs to creep out of a sticky situation at very low speeds. A mud pit, a tall "stair," wet grass or deep sand are all situations in which the added traction might help. Only some dedicated 4x4s have locking rear diffs and very, very few add locking front diffs. If you need to use them, start with the rear and add the front if you're just not pulling out of or over the obstacle. An even smaller subset of trucks will allow you to lock the rear diff in 2WD; the only two I know of off the top of my head are the Ford F-150 Tremor and Raptor. Only do this off-road! There, it virtually turns the trucks into quad bikes, allowing you to easily drift through corners at relatively high speeds, using the throttle to steer. A ton of fun, but please don't try this on pavement. Hill Descent Control: Trucks have always had hill descent control in the form of very low gearing. More recently, manufacturers have begun adding electronic Hill Descent Control either to idiot proof their trucks or to make up for failing to fit gearing low enough to adequately control the vehicle during very steep descents. Every manufacturer's HDC works a little differently, but to the best of my knowledge they all employ the ABS system to activate the brakes to regulate the vehicle's speed. The problem with this is that the activation tends to cause the vehicle to squat forwards on its suspension, potentially screwing your approach angle or even shifting the weight dangerously far forward on extremely steep slopes. As a result, it's less capable than the mechanical control provided by a true low range gearbox, but if your vehicle has it, it needs it. So use it. What To Take With You: Zach Bowman at Road&Track wrote an excellent article on the basic tool kit you need in your truck anytime you go off-road. I can't do better than that, so will just suggest you take his advice. The basic idea is to be able to deal with your vehicle becoming stuck or disabled without relying on anyone else's help. But, the best thing you can take with you off-road is a buddy in another vehicle. Worst case scenario, they'll be able to go get help. But they could also be invaluable in just providing another set of eyes, hands or brains when dealing with any sort of problem or a quick and easy tow out of a sticky spot, saving you hours of digging or rope work. Before going off-road, I like to prepare any vehicle by adding Slime sealant to its tires. This has the ability to stop any puncture before it becomes a problem. I also carry a can or two of Fix-a-Flat, which both re-inflates your tire and seals punctures once you've got one. Both are total lazy man's fixes, but can really save you time and effort in really significant ways. On top of both, you're going to want to arm yourself with the most tire repair capabilities you're able to and at least one full-size spare; two if possible. A plug kit, pressure gauge and bicycle foot pump, as well as the stock jack, should be considered the minimum requirement. An aftermarket, high-lift jack and air compressor add considerable capability. Once, while attempting to fix some idiot's car off-road in Death Valley, a passing group had something called an ARB X-Jack, which inflates off the car's exhaust, lifting all four wheels off the ground on even loose, steep or soft surfaces. That's an awful lot of additional capability for just $235. You're also going to want a full-size shovel for digging stuck wheels out or modifying the ground you're about to drive over and traction-aid devices like MaxTrax. A basic vehicle survival kit containing a case or two of bottled water, a warm blanket and stuff like that is also obviously a good idea, particularly if you're way out there. Consider the terrain you're going to be driving through and the conditions you'll be driving in. Throwing a chainsaw in the bed could be super handy if you're driving through a wooded area, for example. Angles and Clearances: Your truck has three main angles you need to familiarize yourself with: approach, departure and breakover. You also need to know how much clearance lies between your truck's undercarriage and the ground. Approach is simply the angle between the bottom of your tire and the front bumper, dictating how steep or high of an obstacle you can drive onto. Breakover is the angle between the wheels and the body, between them. You can high center your truck if you exceed its breakover angle and man, that is a difficult kind of stuck to get out of. Departure is the same as approach, just at the rear of the car. Due to beds and tailgates and rear bumpers and exhaust systems, most trucks have departure angles slightly lower than their approach. Bear this in mind as you climb off of steep sections and even as you climb onto steep slopes — the vehicle can achieve enough angle to drag the bumper even just approaching an obstacle. On ground clearance, you need to have a decent working concept of the shapes and locations of mechanical parts underneath your car. Does a diff or exhaust hang way down in a certain location, limiting clearance? Hitting stuff like that is bad, particularly at speed. Compare all these numbers when shopping and choose the vehicle with the best numbers. These figures are also what you're modifying when you fit larger tires and lifts. As you're driving, you don't need to memorize your angles down to the last half-degree, you just need to have a solid working idea of them in your head and be constantly analyzing the terrain you're driving over with them in mind. And also realize that they aren't static, suspension extension and compression is constantly increasing and decreasing your angles and clearance. When in doubt, get out and look. Types Of Terrain And Obstacles: Different types of terrain require different approaches. Mud: It's best to avoid mud, if at all possible. If not, try and ascertain its depth before attempting to drive through it. Then, try and enter with and maintain a healthy amount of speed as you're driving through it. Momentum is your friend. Sand: Air down your tires to maximize your footprint. Water: Do you know where your air intake is? Give yourself a few inches of wiggle room and that's the highest water you can possibly drive through. Bear in mind that even a foot of rapidly flowing water is enough to sweep a car down river and that any water crossing not forded by an established trail or road my require you to tackle its steep, muddy banks and unpredictable floor as well. This is why you'll see people cutting down trees to make bridges on the Camel Trophy. If the water is high enough to cover your exhaust outlet, keep revs up so water doesn't flow in. Snow: Compressed snow isn't much of a challenge for a 4WD vehicle on good tires. Deep, soft snow is. One of those surfaces you need to gain experience with, then understand all the various nuances of to tackle with confidence; there's lots of different kinds of snow. Ice: Level ice such as sea, river or lake ice is very easy to drive on, just bear in mind its ability to support weight (we all know the potential consequences) and watch out for snow drifts. Rocks: The desert is mostly rocky, not sandy. Prepare for punctures, air down enough to reduce their likelihood, but not too much that you risk damaging your rims from impacts. Hills: What goes up, must come down. Beware blind summits and ridges, the hill could fall away sharply on the other side and most modern trucks have incredibly poor vision while ascending. It never hurts to get out and walk an obstacle first! Steep Stuff: As pictured, driving up and down very steep hills is largely a function of tractive force (from low range gearing) and friendly angles. The general idea is to crawl along, plan your moves very carefully (often while getting out of the car and walking) and taking care to square any potential obstacles, hitting them at 90 degrees to minimize the chances of the truck rolling sideways. Side Slopes And Off-Camber Obstacles: Thanks to heavy diffs and axles, most tall off-roaders actually have lower centers of gravity than you might expect. But, rolling your truck is fairly irrevocable and will ruin your day; this is the terrain where you do that. Develop an idea of what your vehicle is capable of by slowly working up to steeper terrain and immediately steer downhill if it feels like your truck is about to roll. You can tackle much steeper terrain going forwards and backwards than you can sideways! You'll also encounter obstacles that may lift or drop one side of your truck. These can be a ton of fun; this is where you'll get wheels of the ground. As with any steep or significant obstacle, approach it slowly, squarely and in a manner that will minimize the drop or lift of one side of your vehicle, then be away of the compression and extension to your suspension caused by hitting the gas or brakes. Watch your breakover! Steep ascents or descents complete with obstacles that my lift or lower one side of the vehicle are pretty much the most challenging thing you can face off-road. Hell's Gate, in Moab, being a prototypical example. It requires spotters and a perfect line and getting it wrong involves rolling your truck. If You Get Stuck: All a part of the fun, recovering a stuck vehicle gives you a puzzle you get to solve using both brains and brawn. Winching: Either manual "come alongs" or electric, bumper mounted winches are the most significant tool in your get unstuck arsenal. You can attach their cables or ropes to trees, rocks, a ground anchor or another vehicle and just pull your truck straight out. This becomes complicated when you don't have an easy angle to pull from. Solving that problem may be a case of using a pulley, but is more often solved by pulling a little bit, repositioning your cables, pulling a little more, then so on and so forth until you can drive the car free. Be careful to attach lines to the car only to parts than can take the tug — usually dedicated tow hooks. Towing: The easiest way to get a vehicle out of a situation is simply to pull it free using another truck and a tow strap. But, this is only possible when the truck is stuck oriented in the direction of travel for the tow vehicle and when that vehicle can approach closely enough for the straps or chains to reach and when it's able to achieve enough traction to provide pull. Put the tow vehicle in 4 Lo and slowly creep forwards or backwards, paying particular care to soften the "jerk" that occurs as the line goes taught. You'll probably need to steer and brake your vehicle as you're being towed out. Digging: Got your wheels stuck in something soft and deep? You'll want to excavate the area around the stuck tire or tires, both so you can shove traction-aiding materials like rocks, tree limbs or MaxTrax under them and also to ease the angle they have to climb out. In a pinch, floor mats, kitty litter or found objects can work too. Not Getting Stuck In The First Place: Feel your truck starting to bog down? Sharply spin the steering wheel backwards and forwards to change the angle of attack for the wheels. If you do come to a halt, try rocking the vehicle backwards and forwards using reverse to climb out of the hole. Lock your diff(s) if possible. Whatever you do, try and void pointlessly spinning your wheels, this just digs them in further. Do you enjoy off-roading? What stories and tips can you share with people who aren't yet experts?